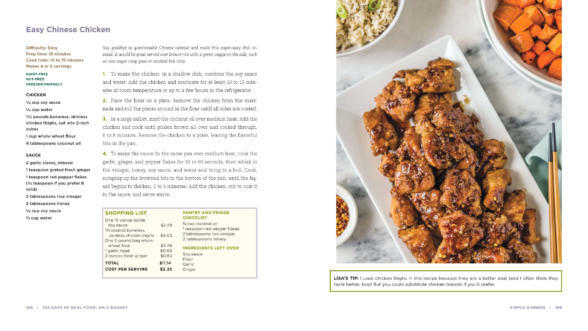 My friend Lisa Leake of 100DaysofRealFood.com just came out with her THIRD book and I couldn’t be more excited to share a recipe with you. Her new book is called “100 Days of Real Food on a Budget” and it has the same mission as her other two books and her site which is to highlight why and how easy it is for a family to eat an unprocessed diet. Obviously, Lisa and I are on the same page, so to speak. My son was looking over my shoulder when I first perused her book, and I quickly jumped at the chance to casually (always keep it chill, Moms) to ask him if anything looked good to him. But I didn’t want to express any hope that Mr. Picky would actually pick a recipe that he wanted me to make for dinner. 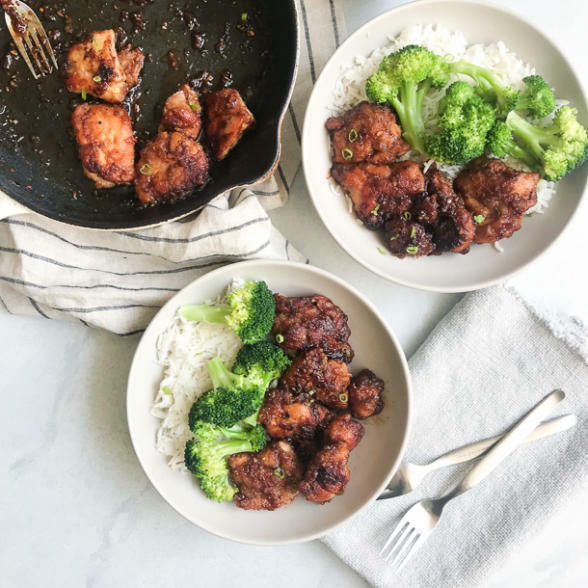 And I continued to keep my cool when he said, “is that Easy Chinese Chicken recipe actually easy?” He failed in love with Asian food when we were in Thailand, on Koh Samui, staying in most beautiful villa ever! “Yeah, I think that looks pretty easy,” I replied. Still not asking if I should make it, but hanging on the edge of my seat. “Maybe you could make that for dinner this week.” HALLELUJAH!!!!!!!!!!!!! “Um, let me think about it. I guess so. It seems pretty quick.” Do not mention that it is also clean and nutritious. And this is my life with a picky eater. Sound familiar? Actually, my son is almost 15 years old and this summer was a big turning point for him. He really started to eat more things and be open to allowing different foods on his plate to touch each other. Baby steps, but it’s progress. There is hope for you parents who are struggling with finicky little ones. Stay the course! Well, this recipe was indeed easy, and budget friendly, and delicious! 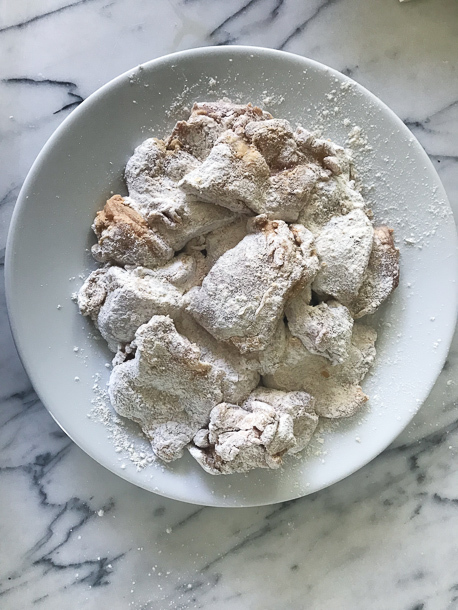 I made it grain-free with cassava flour, but otherwise followed the recipe to a T. I am partial to boneless, skinless thighs which I think have more flavor and are harder to screw up/dry out than boneless, skinless breasts. This chicken would have been equally delicious in a Chinese salad. I personally dislike Chinese takeout food. Yucky refined, low quality oils, and too much low quality soy sauce. It’s also very hard to find Chinese restaurants which use organic, non-GMO ingredients. Therefore, I much prefer to make Chinese food at home. We’ll definitely be making this one again, especially since my son and I both loved it. (Hubs is still vegan!) I served it with rice and broccoli, but this would be great on a bed of cauliflower rice or quinoa, too. Check out Lisa’s book here! I love seeing your creations, so please tag me @pamelasalzman #pamelasalzman! My next online cooking class drops in about 10 days. Check out my online classes here. In a container, marinate the chicken thighs with the tamari and water. Let it sit for at least 15 minutes but if you have the time, let it sit for a few hours for even more flavor. While the chicken is marinating put the garlic, ginger, and red pepper flakes in a small bowl and set aside. In a separate bowl whisk together the rice vinegar, honey, tamari, and water. Set aside. When the chicken is ready to cook, remove the chicken from the marinade and roll the pieces around in the flour until fully covered. Set the pieces on a separate plate. Heat the pan with the oil on medium heat. 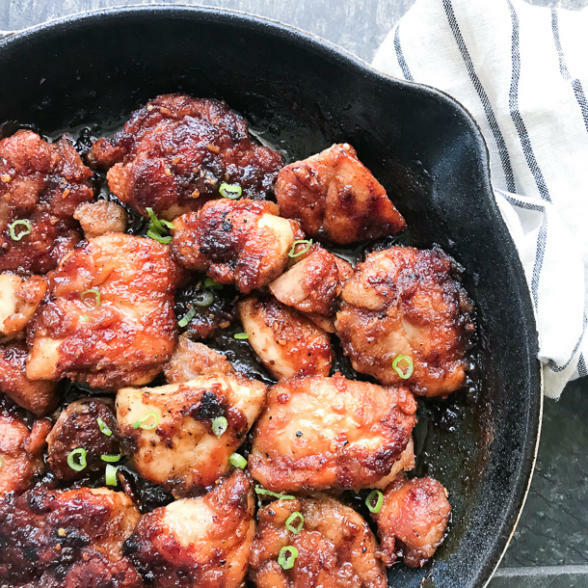 Place the chicken thighs in the skillet and cook until each side is golden brown. Set aside on a separate plate. Make sure to keep the brown bits in the pan for extra flavor for the sauce. In the same pan on medium heat, add the garlic, ginger, and red pepper and cook for 30 seconds. Then add the rest of the sauce and stir, scraping up the brown bits. Once the sauce begins to thicken, add the chicken back into the pan and coat each piece with the sauce. Serve with a side of veggies and rice. *If you’re unsure if the chicken is done, check the internal temperature. It should be 165 degrees F.
I was so excited to make this recipe, but unfortunately mine came out way too salty – it was inedible. 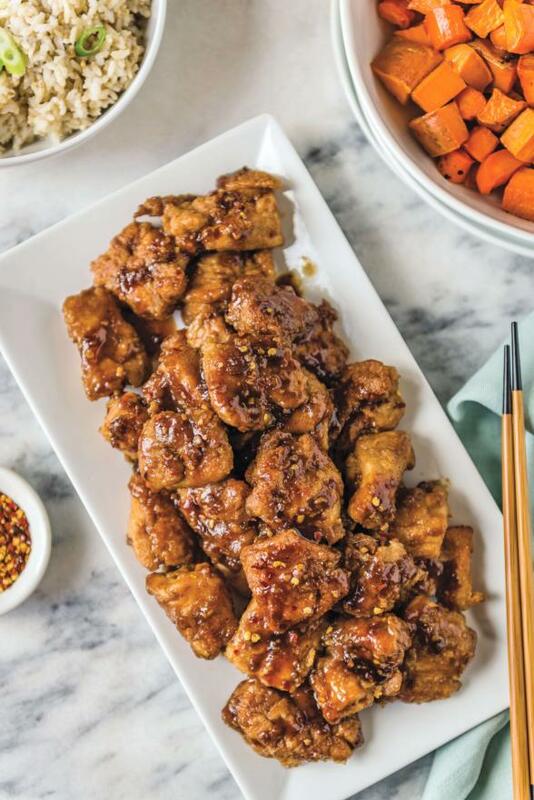 I marinated the chicken in tamari for about 90 minutes before cooking – was that the culprit? Did I let the sauce reduce too much? I am usually competent at following recipes so this has me baffled. Thanks! Gosh, I’m sorry the recipe didn’t work for you. I made this several times, and I thought the salt level was great. I used San-J regular tamari every time. 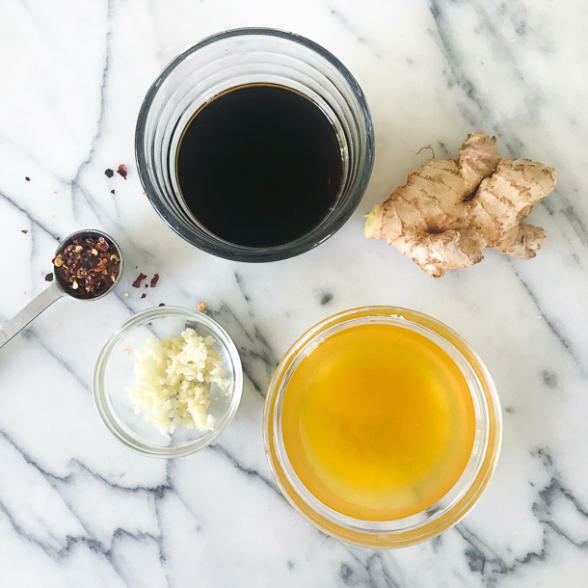 Did you marinate in tamari AND WATER, not just tamari? If you did add the water, perhaps your brand of tamari is super salty. Next time cut it in half. Let me know about the marinade. I’ve never liked Chinese takeout, but this sounded appealing and much healthier. I made it and it was delicious! Highly recommend! I used coconut aminos with a little soy sauce :). Honestly, I dislike Chinese takeout. So gloppy and oily. Glad you enjoyed this as much as I did! can’t wait to try! Can you omit the flour? I wouldn’t. It won’t be as good. The sauce won’t thicken and you won’t get that nice coating on the chicken. You can use so many different flours. I liked the cassava, but you can use tapioca, arrowroot, coconut flour, basically anything you want and make it grain-free/gluten-free. thank you!!! as always! Made your chicken and asparagus from the book last night but with broccoli. I added a little coconut aminos and a splash of oj – So good! What do you think I could sub for the rice vinegar? I’m grain free. Do you think apple cider vinegar could work? I would try white wine vinegar. Thank you. I ended up using ACV because I had it on hand. I used cassava flour, coconut aminos, and no red pepper. It was amazing! What other flours could be subbed for what flour? I don’t have cassave flour but have so many alternative flours I would like to use up if possible. You can use white all-purpose flour, spelt flour, rice flour (although it can feel little gritty), all-purpose GF flour, arrowroot. What do you have? all those flours plus coconut, oat and millet. My freezer is full of alternative flours and didn’t want to add to the collection if I didn’t have to. Thank you!!!! I would skip it entirely if you’re trying to stick to the Whole30 protocol. You won’t miss it. Thank you for sharing! I just made this and its amazing!!! I used the coconut amino acids.